Just days after the DEA busted a 3,200-pound cocaine shipment from Colombia at the port of New York and New Jersey, US federal agents seized 1 million pounds (454 metric tons) of pork smuggled from China to the same port amid growing fears the meat could contain traces of the African swine fever virus that has ravaged the Asian country’s hog herd, and which has sent pork prices soaring. According to Bloomberg, which quoted Anthony Bucci, public affairs specialist at U.S. Customs and Border Protection, the bust marks the the "largest-ever seizure of agricultural products in the U.S." The pork arrived in more than 50 shipping containers over the past few weeks to the port in Newark, hidden in containers of ramen noodles and laundry detergent, he said. While humans can’t be infected by the hemmorhagic virus, pig populations can be wiped out by African swine fever. As a result of the outbreak, China’s hog herd - the biggest in the world - has plummeted as farmers cull inflicted animals. Meat products, and even some animal feed, can carry the virus, for which there is no vaccine. Fears of contamination prompted the aggressive response: since the U.S. has never had African swine fever, officials are stepping up efforts to keep the disease out. With US exports already hit hard by the ongoing China trade war, which recently resulted in the widest ever trade goods deficit, any sign of illness stateside could mean even more pain for US producers as pork buyers start banning American exports at a time when producers are already suffering from Chinese tariffs. 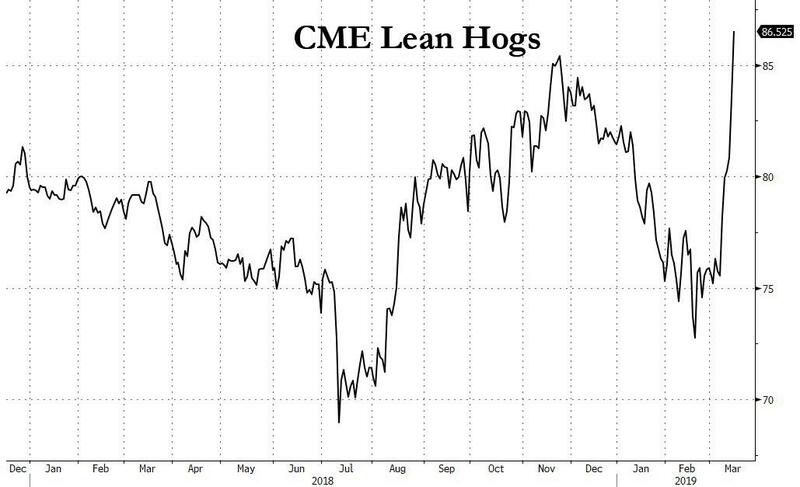 Meanwhile, as the highly-contagious African swine fever devastates Asian herds and Chinese hog inventories tumble, hog prices traded in Chicago soared amid speculation that China’s herd culling will force the nation to import more American pork. June futures soared 11% in the week ended Friday, a record gain for the contract. Shares of meat producers also climbed, with Tyson Foods, the biggest U.S. meat company, up 4.7% this week. Pork accounts for 11% of its revenue. Shares of Brazilian food producers JRS and BRF have also surged in recent days. JBS, which gets 10% of its revenue from U.S. pork, is up 12%. China has also boosted purchases is the domestic market, with Bloomberg noting that pork prices have jumped across the Pacific as well, boosting stocks of hog breeders like Wens Foodstuffs and Muyuan Foodstuff. Chuying Agro-Pastoral Group's shares plunged 37% in September as swine fever attacked its herds and it resorted to paying bond coupons in ham. Its stock rose 64% last month. 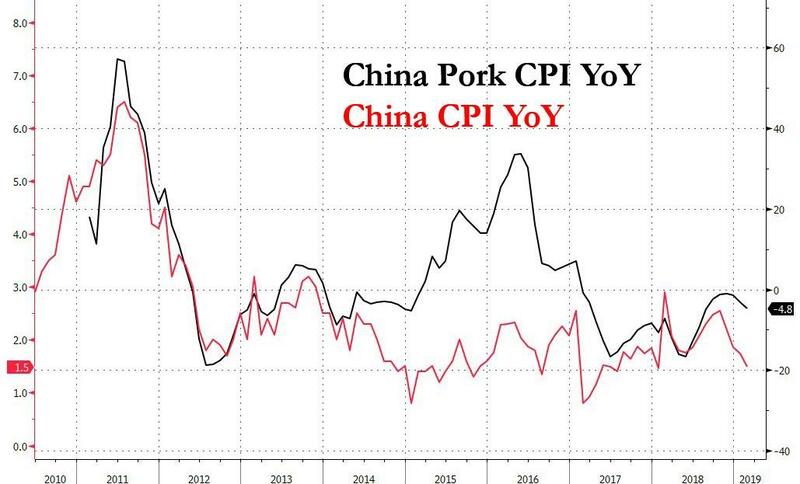 Since there's no sign that the Chinese pork supply crunch will fade soon, it is likely that pork CPI, one of the biggest components of China's CPI basket and which has been declining for the past two years, will rebound resulting in a jump in broader Chinese inflation, potentially leading to adverse implications for China's recent attempts to reflate the economy at all costs. 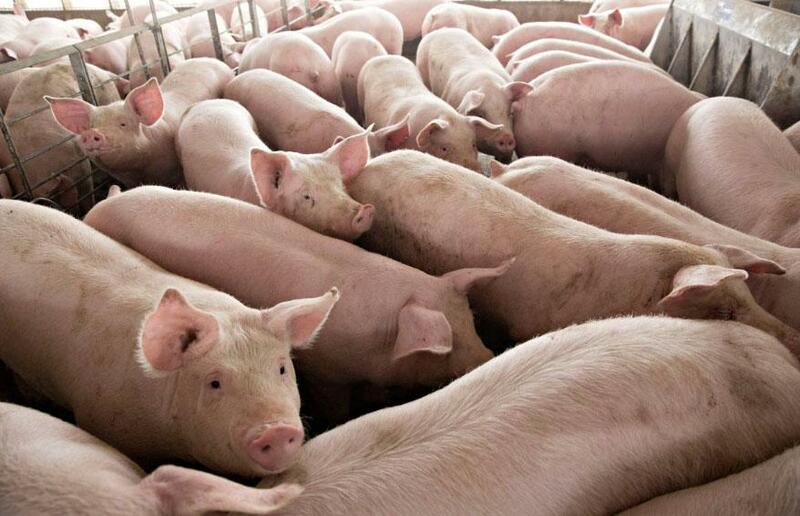 Declining Asian pig herds could also be bad news for another key US export - soybeans, whose prices may slide a soy is used in feeding. Meanwhile, as Bloomberg's Sebastian Boyd notes, poultry prices have been rising as many Chinese consumers would rather have chicken, even though the virus doesn't affect humans, resulting in a Chinese food inflation double whammy.